Bones give our bodies structure, allowing us to walk, ride a bike, and hold something. Bones are hard, but they do bend or give a bit when something hits or pushes against them. However, if the force is too strong, the bones will break (this is also called a fracture). The break is usually caused by an accident, osteoporosis, or overuse (called a stress fracture). A bone can completely or partially break in several ways (crosswise, lengthwise, in many pieces). The image on the right shows different types of breaks. There are lots of medical terms to describe different types of broken bones. A non-displaced break means the bones are still in the right place. A displaced break means the broken bones have moved and the ends don’t meet. An open or compound fracture means the bone sticks out through the skin or a wound penetrates right down to the bone. Broken bones that don't come out of the skin are called closed fractures. Children's bones are different from adult bones, and heal much faster. Children's bones are also softer and tend to buckle or bend rather than completely break. Buckle fractures involve small area of compressed, or squashed, bone. 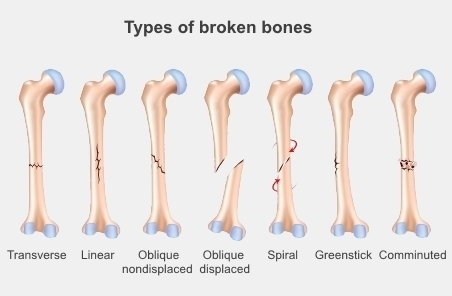 Another common break in very young children is a greenstick fracture, which only goes partway across the bone. Children can also injure their growth plates, which are the areas where their bones grow, at the end of their bones. Broken bones are usually diagnosed with X-rays, which give clear images of the bone or bones involved. If the break is bad or the X-rays don't give a clear diagnosis you may have a CT scan to give a clearer view. All treatments for broken bones put the pieces back into the right place and stop them from moving until they've healed. Often a doctor or nurse will put broken bones back into position. This is called a reduction, or setting. Broken bone ends heal by knitting back together with new bone being formed around the edge of the broken parts. Soon after a bone breaks, your body forms a protective blood clot and callus, or bump, made of collagen, around the break. New threads of bone cells start to grow on both sides of the break and grow toward each other. The break closes and the bone absorbs the callus. Healing can take from several weeks to several months, depending on how bad the break is, your age, and how well you follow your doctor's advice. Read more about how to care for your cast. This video explains a bit more about how broken bones heal. If you broke a bone and have osteoporosis, make sure you follow the advice on Living with osteoporosis to prevent it from happening again. For more information about specific broken bones in adults, and how they're treated, see Bone & joint problems. For more information about specific broken bones in children, and how they're treated, see Children's bones & joints.